Habits Secret, under jockey Cristian Esqueda, winning the $25,000 Sawgrass Stakes Sunday afternoon at Hialeah Park. HIALEAH, FL�FEBRUARY 7, 2016�Multiple stakes winner Habits Secret defeated a tough field Sunday when he raced to a neck win over Eyesa Famous Eagle in the $25,000 Sawgrass Stakes at Hialeah Park. Daytona B and Parti Favor finished half-a-length back in a dead-heat for third. Ridden by jockey Cristian Esqueda, the 6-year-old horse by NO SECRETS HERE, covered the 440 yards in :21.596 seconds, a 95 speed index into a 12 mph crosswind. Trainer Sergio Concepcion saddled Habits Secret to his 10th career win for owner Ricardo Martinez. Winner of last year's Hialeah Derby, Habits Secret pocketed $16,960 on Sunday to bring his career earning mark to $324,374. Vessels Stallion Farm, LLC bred Habits Secret in California from the Apollo (TB) mare Habitual Dreamer. Also the winner of the Bradford Stakes and the Governors Stakes, he has compiled a (23) 10-4-4 record. Making his first start since a second place effort to Daytona B in the $353,500 Grade 1 Bank of America Challenge Championship at Lone Star Park last November, Eyesa Famous Eagle earned $5,035 for second. Judd Kearl conditions the Eyesa Famous Eagle for owner Cesar Dabdoub. The multiple stakes winning Texas-bred was ridden by Rodrigo Vallejo, the 5-year-old has earned nearly $180,000. Daytona B and Parti Favor each earned $1,855 for their dead-heat. Heavy post-time favorite, Grade 1 winner Daytona B, was never in contention after hopping at the start under jockey Francisco Ramirez, Jr. Coming off three straight stakes wins, the 5-year-old was making his first start for trainer Yoani Abreu. Gregorio Garcia Garza owns the nine-time winner of nearly $490,000. 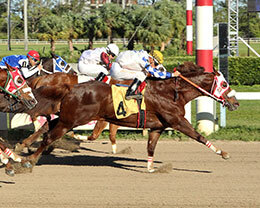 Parti Favor, entered the race off a third place effort in the Hialeah Junior Maturity on January 17. Joe M. Davis owns-and-trains the 4-year-old. Rolando Pina had the riding assignment. Dynasty Of Habits and Streakin Regard completed the field.